I've moved! New blog address. 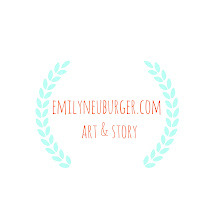 My new website + blog is emilyneuburger.com. Please visit me there! 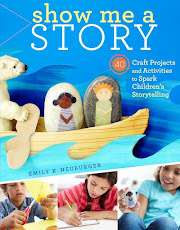 If you have this site bookmarked in a blog reader, you'll want to switch to emilyneuburger.com. Thanks, and see you in my new space! We are making rings and things for Valentine's Day this year: heart button rings, wool felt heart rings, heart button hair ties, and some bracelets too. A pile of little wooden hearts with a fresh coat of paint. Chick is partial to the wooden button heart ring. Mouse loves the soft, wool felt ring. This is more of that earthy, soft, thick, locally dyed wool that I picked up while I was selling at a local craft fair this past fall. The hair tie in action. And, Chick's favorite: the heart button bracelet. I snipped a hair tie elastic, threaded it through, and then tied it, so is just the right size. This is my 1980's hand-in-the pocket shot. It almost looks like I am wearing stone washed jeans, right? Materials: paint, wooden hearts (wood section in your local craft store), black 1/4" flat elastic, scissors, thread, wool felt, elastic hair ties, and a drill. After painting the little hearts, drill holes in them to make them into heart shaped buttons. The size of the holes depends on what you wish to do with them. Tiny holes are perfect for sewing them onto the black ring elastic, and larger holes are better for threading hair tie elastic through. Make the elastic rings. 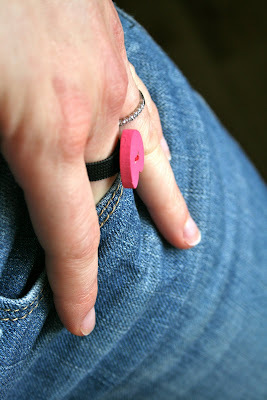 Measure little fingers and snip off a piece of flat elastic. While sewing the elastic into a ring, use a slightly larger piece with some overlap, and then snip off any part that hangs over. Once you have a bunch of black elastic rings, sew wooden hearts, felt hearts, or whatever you want onto the rings. We are planning to have a little ring decorating afternoon where Chick and Mouse will help design rings and things. I bought a bag of tiny paper flowers too, and the kids loved how those turned out. I'll show you pictures of those in another post. I did all of the sewing for this project, but I do plan on having the kids use some glue to decorate some rings on their own. 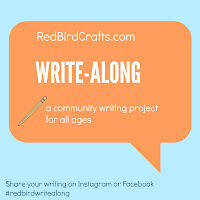 I love to hear from readers and I am so happy when others link to my projects. However, please do not reproduce images or content from this site without permission. Thank You!